Deric's MindBlog: Our digital presence. Here is an interesting tally: Active users of social media sites compared with the populations of the world's largest countries. if social media sites were countries, Facebook would be the world’s largest country with more active accounts than there are people in China. 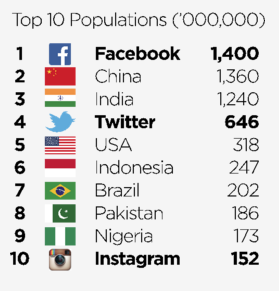 Twitter would rank 4th with twice the “population” of the USA and Instagram would round out the Top 10. There are ~7.4 billion people in the world, ~43% are connected to the internet; ~4 billion, mostly in the developing world, lack internet access. Most pundits expect that by 2025, digital access will have spread to 80% of all people.